This was another book recommended to me by a good friend. I have undertaken an organic interest in Evangelicalism and what exactly it is. For more on that, check out my review of another book on Evangelicalism. 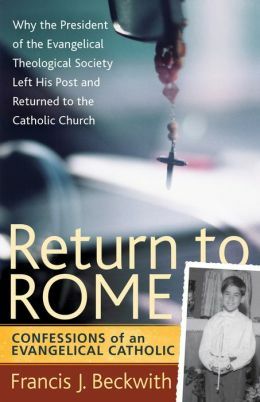 Return to Rome is Francis J. Beckwith's testimonial on how he initially left the Roman Catholic Church, became the president of the Evangelical Theological Society and subsequently returned to the Roman Catholic Church, leaving his post behind him. Beckwith is a superb technical writer. However, his storytelling prowess is not as developed. I give the book 2 of 5 stars for technical merit. He was able to get his point across, even if not in the most captivating manner. After the first two chapters, he begins to lay some theological points down, which is what he is adept at. Again, this book is a testimonial which recounts Beckwith's spiritual journey. It is honest and unguarded at times. He discusses the fact that he was born and raised in the RC tradition. As he grew and took an interest in theology, he was not stimulated by the RC teachers that were supposed to nourish his spiritual growth, so he turned to the evangelicals who were more than willing to teach young Francis. Beckwith recounts various academic exploits that drove him to collaborate with real Catholic theologians through the years. A recurring theme is the fact he consistently came up with the same conclusions that were already propagated by the RC. In the end, he makes the difficult decision to resign from his post as president of the ETS in order to receive full communinion with the RC. A major takeaway for me is the premise of RC versus Evangelical theology. Beckwith succinctly describes Evangelical theology as the process of getting YOU INTO HEAVEN which RC theology is the process of getting HEAVEN INTO YOU. This, of course, is with regard to justification as either an imputed grace or an infused grace. Either way, we are reliant on grace. Either way, grace is God's gift. Either way, God's free gift of grace should change our lives for the better.